My research focuses on stellar populations in the Milky Way and beyond i.e. resolved stars in our own galaxy and ensemble of stars in other nearby galaxies. I have grown to appreciate and understand the importance of dwarf galaxies in undergrad and this research topic is still definitely one my favorites so I hope to one day get back to it! 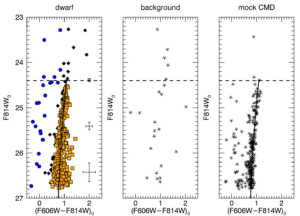 Understanding the census of dwarf galaxies around big galaxies like the Milky Way help constrain our simulations and understanding of cosmology and galaxy formation. 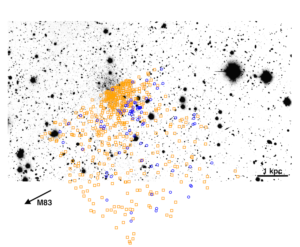 For the undergrad paper I led under the mentorship of Eric Bell, I characterized the dwarf galaxy dw1335-29 using VLT VIMOS images and HST photometry from the Galaxy Halos, Outer Disks, Substructure, Thick Disks, and Star Clusters survey (GHOSTS). I used the tip of the red giant branch method to confirm the dwarf galaxy’s membership to the M83 group. It’s a peculiarly star-forming and non-tidally disrupted galaxy at a 26 kpc projected distance to its host. This is weird compared to the Milky Way satellite population which is mostly quiescent for those within 100 kpc (barring the Magellanic Clouds) and has dwarf galaxies disrupted and spread across the stellar halo at distances of 30 kpc like Sagittarius. The color-magnitude diagram of the dw1335-29 where the tip of the red giant branch is marked with the dash line (left) and the VLT/VIMOS image overlaid with the resolved stars from HST in orange and blue (right).